A kabob is only as good as the meat you put into it, and I've found kabobs are pretty particular with the meats they like. So I have another addition of Meat Tips, and a continuation of the kabob craziness, to help make sure you're buying the right meat to ensure skewer success. Meat cubed. To start, you're going to want a meat you can uniformly cube. I stay away from pre-cubbed kabob meats, because you don't always know exactly what they are and cutting your own cubes will make sure you're getting the best and freshest product. 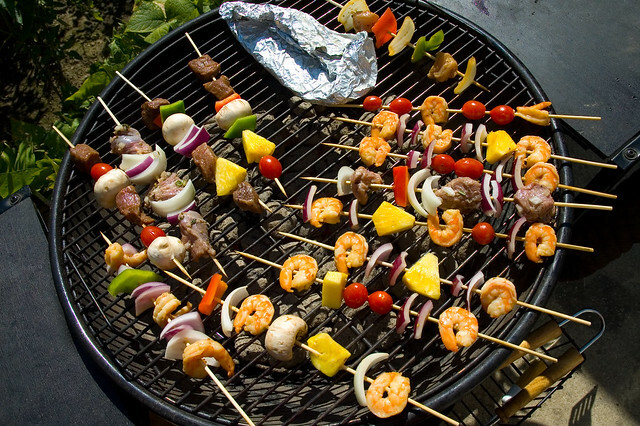 I usually cube my kabobs into 1" cubes, so I'm looking for a piece of meat cut at least 1" tall. Making sure you have uniform size cubes ensures that all pieces of meat on the skewer will be done at the same time. Look Lean. For kabobs I almost always choose a lean cut of meat. This reasoning behind this is two fold. First, lean meat is easiest to chew off a stick; I find fatty pieces hard to rip with your teeth and take too much time to chew until you get to the next piece. 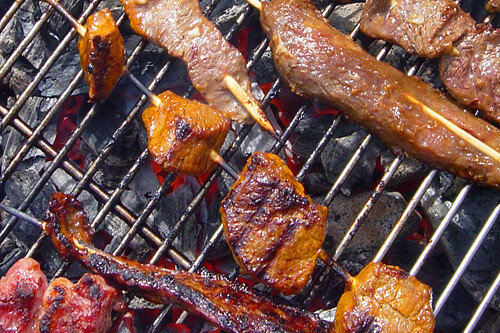 Secondly, lean meat usually takes on the flavor of marinades well, and I almost always marinate my kabob meat. Take them for a bath. As I was saying, I like to marinate my kabob meats. 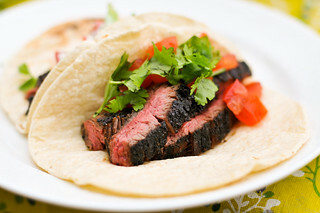 This brings a lot of flavor to the meat and also adds just enough moisture to help keep it alive over the high heat. 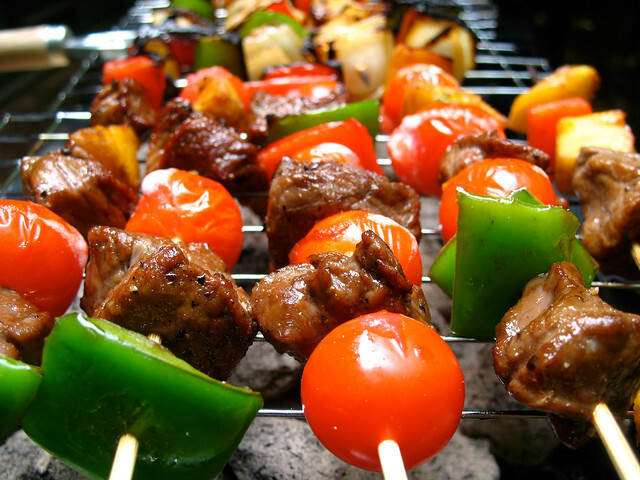 The following recommendations are for kabob meat that you intend to cube and marinate. 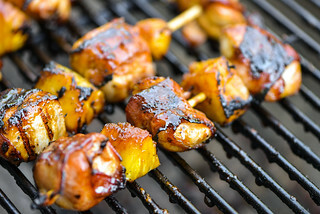 I take no responsibility for the dry, tasteless kabobs you make sans-marinade. Beef. For beef I go with sirloin. Sirloin steaks are usually cut about an inch thick to begin with, have little fat, and have a beefy flavor a little more delicate than other cuts. This allows you to get the full flavor of the marinade with a nice underlying beefiness that isn't over powering. Chicken. I said I'm over skinless boneless chicken breast, but kabobs are an instance that I still find good use for them. They are rather tasteless, and tend to dry out, which makes them perfect candidates for a marinade. I find that chicken will end up tasting the most like the marinade than other meat you can choose. Pork. 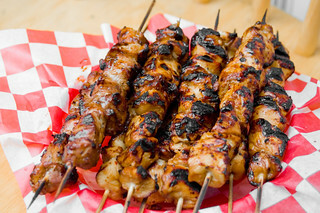 The tenderloin is kabob champion for pork. It comes in a great size for cubbing, and once you trim off just a little excess fat and silverskin from the outside, the whole cut is pure lean meat all the way through. The tenderloin also stays, um...welll, tender on the grill. Lamb. Lamb ranges the spectrum from cheap and tough, to expensive and tender, so as an affordable middle ground, I go for the shank end of the leg. There will be some extra removal of sinew and fat from this cut, but the little work is well rewarded with kabobs that have a deep, rich flavor. What about what's in between the meat, son? Veggie mountain! You'll have to start a new blog for that...Veggiewave! could you give me the marinade recipe for your sirloin kabob? it looks absolutely delicious and i would love to try it! ... as well delish moist, filling not full. Would have appreciated M&M how purchase, product number. I don't understand the reason for marinade. Shouldn't we just try to buy natural meat with good flavor? Thank you for your posting! I am making kebabs today and found your info very helpful. Shish kebab in the countryside - what could be better? Everyone would like to treat yourself and your loved ones succulent flavorful dish. But what a shame, and how the mood is spoiled if something inedible is obtained instead of the expected to the meal dishes. If a shish kebab is made from beef, failures and are not at all uncommon. To avoid disappointment, I can recommend good ways to shish kebab of beef pinkycloud.com/beef-shish-kebab-secrets-of-pickling-of-meat Marinades for shish kebab are divided in two groups. The first one is suited for delicate fish, chicken and soft pork. The second group is suitable for thicker meat which may become rigid and viscous during preparation on skewer. These marinades contain so-called aggressive additives: %u2013 citric acid, %u2013 vinegar, %u2013 red wine, etc. Here we are advised to cook the vegetables separately from meat. 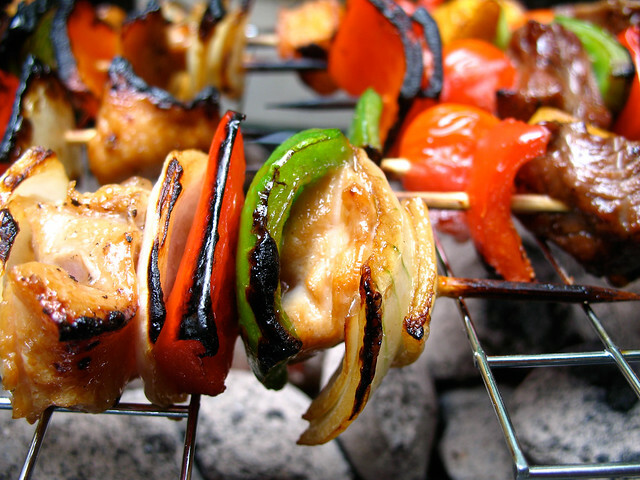 But vegetables should be cut quite large for a shish kebab, so they prepared both with meat and not burnt. Therefore, consider cutting the size and try not to cut the vegetables very finely. Thanks for these meat tips! 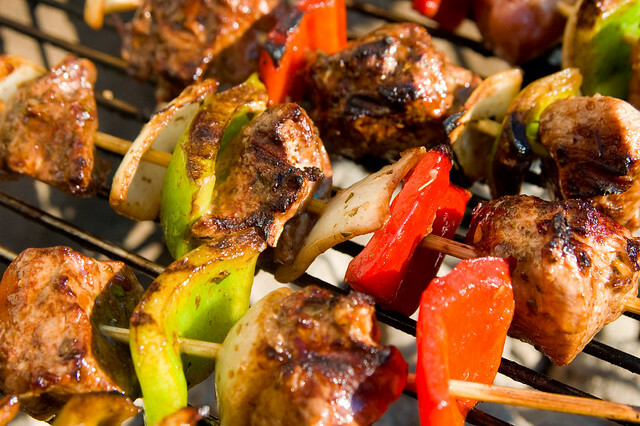 I like that you mentioned that you should marinate kabob meats because it can bring out a lot of flavor. I'm interested to learn how long this should be done, especially if it shouldn't be done for too long.